Lakeport – Let's Go RVing! Jerry wasn’t feeling well this morning so we got a late start plus we had not decided where we were going. He went over to talk with the staff in the office to get some brochure and ideas but they really didn’t have any. Actually he said they talked about the economy of the area! 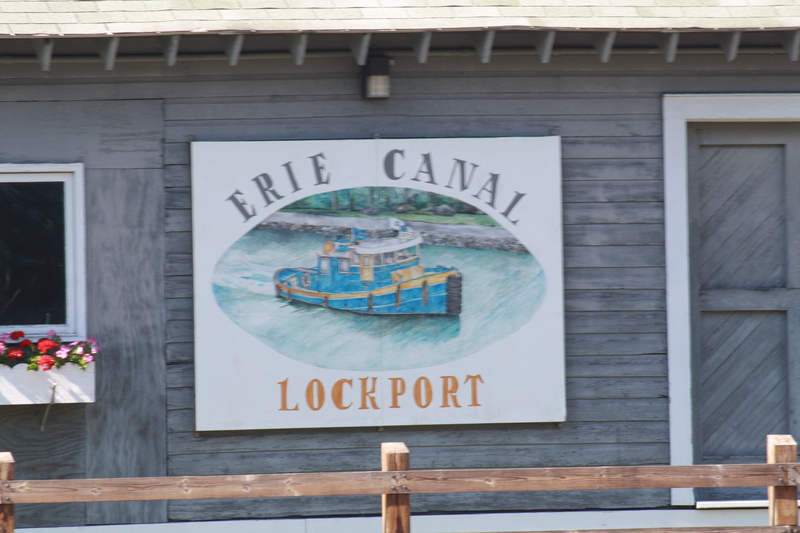 We finally decided on Lakeport to see the locks on the Erie Canal. We got on the road after 11:00. Riding through the small villages is so interesting. In Mt. Morris we saw a sign for an armful of firewood for $4.00. Wonder whose arms he is talking about. When we put the address of Lakeport in the GPS the mileage and the time to get there were very different and we wondered why. Well, this part of the New York is full of small towns or villages about every 5-6 miles: Alabama, Catavia, Gasport, Leicester, Pembroke, York and many others. The speed limit is 55 but when you get to one of the villages it reduces to 40 or 45 thus the slow down. There are many red barns around, some in obvious use and some dilapidated. We discussed whether the area used to be for cattle farming as we also saw a number of decaying silos. If so we didn’t see a lot of evidence to that end. We did see some dairies but not many. We did see a lot of dried corn and huge fields of cabbage! Is this where our cabbage comes from? We also saw several roadside signs advertising sweet corn and peaches. I had forgotten that their season is later than ours. It is very pretty county with mountains in the distance – we can see some of the trees beginning to change and we were told that Letchworth State Park would be beautiful in another month! Oh well! We got to Lakeport about 1:00 only to realize that the cruises were at 11:-00 and 1:00. We ate our picnic lunch in the car and then tried to find the museum. We ended up finding the Visitors Center where we got the usual magnet and Jerry quickly bought a t-shirt. Then we walked down to the locks. They are absolutely huge although the water is only 12 feet deep and the canal is longer than the Panama Canal. 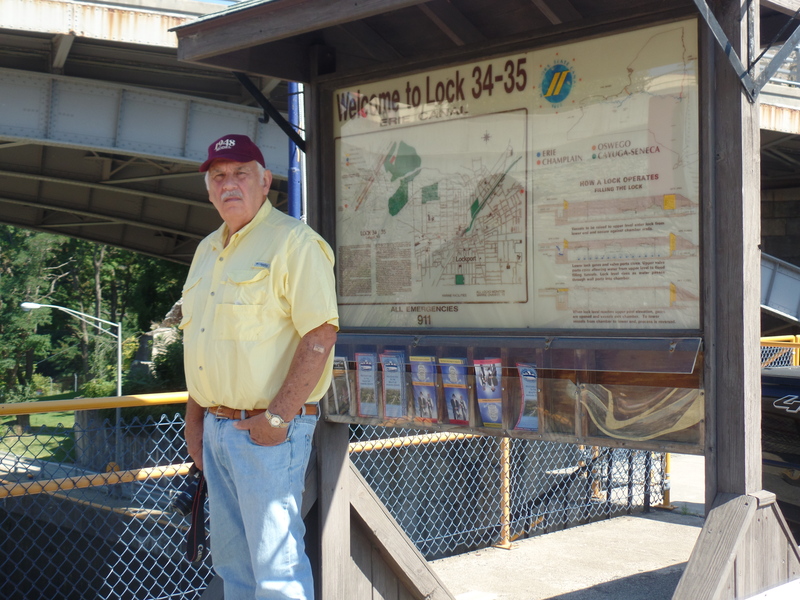 After wandering around the locks we went to the cruise pick-up. We looked around the gift shop for a while but didn’t buy anything. The cruise started at 3:00 and was well worth the wait for the Lakeport View V. We went through two of the five locks and to watch the water rise and realize that the boat is also rising is remarkable. We went in the first lock and when both ends were closed the water began to rise. It was awesome to watch the water line on the wall rise as it slowly rose to meet the water on the other side of the lock. As we were coming back and repeating the process we realized that when the water is receding it occurs much faster than when the lock is filling up. After going through the locks both ways we cruised a bit further down the river. We passed a stone house, the only one in the area that is built from the actual stone that comes from the ground. We also saw a beautiful stone church built by someone who wanted to be married in his home church in England. When that became impossible he built a replica of the church in Lakeport! We also rode by a nice park that has a tree garden of 100 trees donated in memory of people. It was quite pretty. The captain also told the story of the gentleman who had invented the fire hydrant and lived in Lakeport. Ironically enough the company burned while he was on a European trip. One very interesting feature on the ride is the bridge that has to “open” to allow large boats through. Our bridges open vertically but this bridge “opens” horizontally. In other words, it doesn’t open, it rises. As we returned to the dock and were facing the bridge again the captain played a recording of Kate Smith singing “God Bless America” and we were able to see the American flag, the New York Canal Flag and the State of New York flag. Since the noise was a bit loud I could sing along with her. It brings out the patriotism is everyone! Another interesting feature was another bridge along the cruise route. It is the longest single span bridge in America that has no supports under it. It spans from one side to the other. We talked about going to Niagara Falls after the Lakeport visit and I thought Jerry was talking about the New York side but he was talking about the Canadian side. Not sure why he wants to go over since we’ve been before but if he wants to do we’ll go! Since it was after 4:30 when we completed the cruise we decided to wait until tomorrow! After we left Lakeport we headed toward Corfu which was only about 20 miles away to Yancey’s Fancy where they have delicious hand crafted cheese. When I suggested it to Jerry he must have had a brain lock because he said we’d go but they didn’t spell it like I spell my name. Wrong! Well, after 25 years he has finally learned to spell my name! They have quite a selection of cheese and we ended up getting a small container of buffalo cheese dip and then back a few minutes later to buy a wedge of buffalo cheese. Wow – is it hot? We headed on back to Mt. Morris with a brief stop at Tops Grocery in Catavia. Fortunately I had prepared sloppy joe mixture at home and we put it out this morning to thaw so dinner was easily accomplished. After watching the Republican presidential debates we are headed to bed as we have a full day tomorrow!